Just a few short days ago, I said the Democrats weren't going to take a lefty blogger's advice and leave Governor Palin alone. Well, score one for me, two stories out today says that Obama's Flying Monkeys (James Carville and Rahm Enmauel) are going to try to go after Governor Palin as they did Rush Limbaugh! Considering how the Rush Limbaugh attacks worked out for them, you would think they would know better than to attack Palin. Over at RedState.com they see four reasons why this will backfire on the Democrats. The Democrats risks making Governor Palin the automatic front runner in 2012. 41% of Independents (as per Pew Research) said they were turned off by the media's attacks on Palin. Attacking women is always risky business. Voters are expecting Democrats to lead not attack like the opposition party. The take over at HotAir.com is that Governor Palin is minding her own business over in Alaska, attacking her will look gratuitous. I have a different take. Until now, Governor Palin, has kept her mouth shut on national politics. The only real thing she has spoken about was the Stimulus Plan and only in the context of her state. Attacking Governor Palin will give her plenty of excuse to interject herself into national politics. Sarah Palin is a natural populist, given the underlying rage in the public right now, one common sense appeal coming from a perceived common man (or in this case woman) and Governor Palin could easily turn the tide against the administration. We need look no further than MEP Daniel Hannon's overnight success. With Rush Limbaugh the Democrats were playing with matches, with Governor Palin they could be playing with an H-Bomb! Stay tuned! Did you catch Glenn Beck today? If not you missed a good one. Glenn had on the Connecticut Attorney General Richard Blumenthal. Mr. Blumenthal was all ready to showoff his populist street cred, by telling how he went after the AIG employees' bonuses. Unfortunately, Mr. Blumenthal forgot to check to see if there was any law giving him the right to do so. Glenn Beck totally nails this overreaching weasel, live! This is exactly how Republicans must treat these overreaching socialist Democrats when they extend their authority deep into the private sector. Congresswoman Michele Bachman (R-MN) got Turbo Tax Timmy on the hook the other day, when she demanded the tax cheat site where in the Constitution would he find authority for these new and overreaching powers for the Treasury. Of course Turbo Tax Tim was stumped. When that happened, Congresswoman Bachman should have bashed his brains out for having the gall to walk in there with such an unconstitutional idea. She should have called him out loud and clear. Next time Congresswoman Bachman, it's bait 'em, hook 'em, bash 'em and repeat as necessary! Shovel ready or digging a whole? Here is an op-ed piece written by Alaskan Governor Sarah Palin. It appeared in the Alaskan Daily News this weekend. For those of you conservatives who are a little wobbly on the Gov., this should show you when it comes to being fiscally conservative Sarah Palin gets it. For those of you on the left, here is just one more reason why you need to fear this woman. Not only did she actually READ Obama’s so called Stimulus Plan, she is pointing out all the strings that are attached and is leaving it up to the people of Alaska to decide if they want to dig themselves into a bigger whole. Note: look at the paragraph second up from the bottom, see how she uses her state’s charter to justify the rejection? I don’t recall any of the other conservative governors doing the same. Also when it comes to the economy Governor Palin’s theme seems to be prudence. When oil was at $140 a barrel, her state was running a huge surplus. Rather than spend, spend, spend, Governor Palin socked away almost 8 billion in several state accounts. Can you imagine where we would be if Washington was so prudent during the good times? Some question my decision to accept job-ready stimulus funds, while leaving on the table for discussion other funds that grow government. Washington dollars are tempting, but we must consider whether they create sustainability, help develop our resources, reduce dependency on Washington, and all without mortgaging our kids’ futures. Under federal law, I must certify that every stimulus dollar will create new jobs and stimulate the economy. I take that charge seriously. Accordingly, I’ve requested $514.4 million for capital projects that legitimately create new private sector jobs. Shovel-ready projects are certifiable because they put people to work and grow Alaska’s private-sector economy. Unfortunately, a disproportionate percentage of the federal package available to Alaska would increase government operations. It’s a stretch to certify that more spending on more bureaucracy actually grows an economy. When stimulus money runs out in two years, who will pay for the expanded government programs, when Alaska currently has a budget shortfall of over a billion dollars? My administration will not willingly and knowingly dig a hole for Alaskans to fill under this enormous, debt-ridden, Washington spending plan. That's why public discussion on budget increases must happen through open, transparent legislative hearings so everyone is aware of the cost. I am deeply committed to quality public education, so I appreciate questions concerning my $20 million dollar request for certifiable funds. Regarding other available funds, I have sought public discussion on school district spending plans. Alaska’s children are my priority, as proven by my unprecedented increases to K-12 funding, including intensive needs programs, which we currently fund at historic levels. 24 months. The districts should present spending plans that don’t dig huge fiscal holes when temporary federal funds disappear. Will they wisely and prudently fund training for existing positions, or just create new positions, leaving Alaskans to foot the increased bills? When one-time funding ends, will they lay-off all those new teachers? Are Alaskans willing to shoulder the expanding programs in the education bucket, including questionable priorities, like proposed increases to the National Endowment for the Arts? Alaskans must have confidence the additional funds will produce actual results for our children and not simply increase bureaucracy. Remember, these dollars aren’t “replacement dollars,” they are “additional dollars,” and obviously increase budgets. I’m approaching federal funds and mandates with caution, but won’t stand in the way of organizations or communities applying to the feds for funding their own expansions. communities would have to adopt building energy codes that compliment the most recent International Codes. These standards should be locally determined, not federally mandated. And, if we take additional unemployment compensation funds, Alaska would have to extend eligibility guidelines. This federal involvement locks us into government dependency for longer periods. Alaskans must read the fine print on these federal mandates, because certain allocations also require state-matching funds. When Alaska was granted statehood, it was with the expectation that our independent, innovative spirit and rich resources would largely sustain us, rather than depending on federal government. Creating more dependence on Washington steers us away from Alaska’s magnificent potential and destiny, and that, to me, is a problem. My job is to help Alaskans count the cost for the long term, not sell our birthright for short-term gain. Alaskans must acknowledge that if we dig a fiscal hole, it will be filled by our families and businesses. Reliance on Washington is not our only option. We could exercise fiscal responsibility and prudent planning, develop our resources, energize Alaskans, and revitalize our spirit. We are up to the challenge. This is the best lesson we can teach our children. 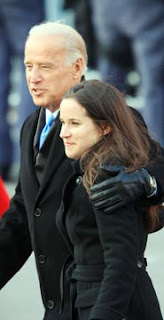 There is a story about Joe Biden’s daughter Ashley, making its way around the net. I am not going to link to any of them here or give the details about it. In all honesty, there was a time I would have happily pointed the story out, however after watching the rabid jackals on the left tear into Bristol Palin’s private life, I have decided to be an adult. Ashley Biden did not make any speeches for her dad or Obama during the campaign. She did not write any editorials on the matter and she didn’t even blog about it. What does that mean? It means that she chose to stay a private citizen. We all should honor that, the media too. When a family member takes an active role politicking for the candidate, then they are open to criticism. Mitt Romney’s sons actively campaigned for their dad. Chelsea Clinton actively campaigned for her mom. These family members chose to give up their privacy in order to promote their parents and therefore their actions are now open to criticism. This is not a hard concept to understand or to follow. I hope my fellow conservatives and those in the media will follow this logic. If there is one thing I cannot stand about Washington elites, it is the way they hand down rules, regulations and marching orders to We The People and then don't follow them themselves. Like Joe Biden telling us how it is now patriotic for us to pay higher taxes, then having a bunch of tax cheats appointed to the administration. Well folks, here is yet another elitist following the “Do As I Say, Not As I Do” mantra. It appears Al Gore had all kinds of electronic goodies running inside his palatial Tennessee estate during Earth Hour! That’s right, We The People from the unwashed and ignorant masses were told to turn off our Pcs, televisions and so forth for one hour and sit in the dark like cavemen in order to save the planet. Meanwhile, Al Gore, who gets praised to the high heavens for his science fiction movie An Inconvenient Truth gets to party like it’s 1999! Hypocrisy thy name is Gore! This isn’t the first time Al Gore has been caught out there with a size 15 carbon footprint. He has been caught using too much electricity at his mansion, taking private jets and riding in SUVs. He defends his elitist hypocrisy by saying he buys carbon offsets to make up for his indiscretions. Tell you what Al, instead of spending money on those carbon offsets, why don’t you pay my rising taxes instead? You can pay them in person at the US Treasury, that way you and the other hypocrite Geither can discuss the meaning of the word gall! Upon telling other blacks that I am a conservative, the first thing they say after recovering from shock and awe is WHY? This is never an easy question to answer, not because I don’t have a clue, but rather because the person asking the question doesn’t have 5 hours to hear the full answer! In this series of posts I will attempt to fully answer the question in under 5 hours, promise! So sit back, relax, grab a cup of Joe and here we go. First, we begin with something that many blacks know but will not admit. They have strong conservative beliefs. Some have strong social beliefs (e.g. Pro-Life or pro religion). Some are fiscally conservative (hates taxes) and some are both. Despite these beliefs, the vast majority of them blindly drink the Kool Aid and pull the “D” lever each and every time. But why? Blacks vote for Democrats for two reasons. First, is that they bought into the notion offered by white liberals, that blacks are societal victims. They are told that the problems in their lives today stem from the residual effects of slavery and covert systemic racism. The second reason, is that blacks are sold on the idea that they are the little guy and need help in “leveling the playing field”! I chose a different path. I stayed true to my conservative beliefs and values. I see my place in life more as a result of what I did or failed to do. While I see myself as a little guy, I think the best the government can do for me is to get out of my way, so I can someday become one of the big guys! The origins of my beliefs. I got my conservative beliefs from my family. I come from a family that has a strong work ethic, believed in taking responsibility for their actions, strongly believe in God and truly loves this country. Growing up I was shown these beliefs everyday. I saw my parents rise early and head out to work everyday. They took me to church every Sunday and showed great respect to the Lord. They put their faith only in their own abilities and the Lord. I saw my parents take great pride in the things they earned, and the way they presented themselves and the family. They showed their love for this nation by serving in the armed forces and never missing their opportunity to vote. These values and beliefs stuck with me. They became my core. They are neither blackor whitem but rather they are universal. The never go out of vogue, they do not require constant updates and they have served me well in the past. I use them everyday to make my way in life with decisions big and small. So, when choosing a representative in government, why would I choose someone who does not share these beliefs and values? Why I Will Never Drink The Kool Aid [Part 2]: Values and the two major parties. My grandmother, God rest her soul, use to have an old saying that went like this: “If you spit in the sky, it will fall in your face”! Well it appears Obama and the White House Flying Monkeys have spit all over their faces! Their Anti-Rush Limbaugh campaign has pushed El Rushbo’s ratings through the roof! OUCH! Teflon Palin: Another backfire in the making? 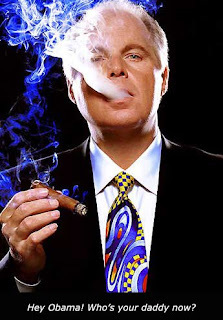 The backfired Anti-Limbaugh plan reminds me of a blog I read yesterday on Talking Points Memo, about how the left’s insane and intense attacks on Sarah Palin could very well backfire on them in 2012. Basically, the blogger warns Democrats that all of these attacks, smear jobs and so forth are only keeping the Governor in the news and that four years from now, their smears will amount to a big fat "so what". He/she uses Hillary Clinton as an example. Republicans kept up the drumbeat on Hillary for years and when she threw her hat into the ring, all the ammo against her was already used and defused. Judging from the comments on the blog, the Democrats are not going to listen to this warning. I have to admit I see some truth in this. I would have sworn Hillary was dead meat when the ‘08 election started. I thought how could such a scandalized candidate ever stand a chance? Yet there she was, the early frontrunner at the start of the Democratic primaries, holding her own against all of the Republican challengers in early polls and dogging Obama’s campaign to the very end. Could the same happen to Palin in 2012? Quite possible, despite the onslaught she faced throughout the campaign and right up to today, Palin’s poll number in Alaska are still quite impressive. All of these attacks on Palin serves as a pre-election vetting process. When new attack comes out, they are being answered by the Governor, SarahPAC and Pro Palin sites like Conservatives4Palin.com and TeamSarah.org. If this keeps up, what will be left to use against her in 2012? Furthermore, many of the Democrats’ attacks against Palin seem to hit the very middle class that Democrats say they support. For example, Bristol’s baby. Many lefties try to paint Palin as a bad mother, because her daughter got pregnant out of wedlock. Well, how many hard working middle class families face the same situation? Are they now all bad parents? What about those cracks at Trigg? Last time I checked, Palin wasn’t the only person in America with a Special Needs child (this attack will prove really unpopular, case in point, Obama’s quick 180 on his Special Olympics crack). 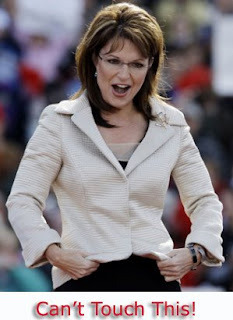 All in all, I see the whole “bring down Sarah at all costs” effort, creating a Teflon Palin. 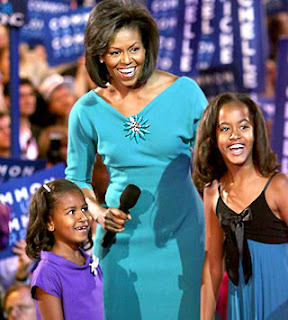 A Sarah Palin who only has to worry about bringing her A- Game and not worried about answering four year old smears. Time will tell, Game On! I am not going into a bunch of TOTUS jokes here. If you want that, check out the Barak Obama's Teleprompter's Blog. Rather, I want to touch on two things that stuck me when I saw Obama use his new Jumbo Promter. 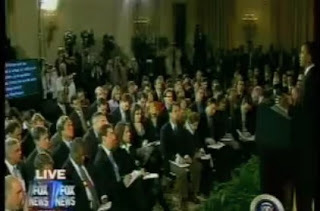 Methinks Obama and his handlers are finally starting to notice that the over use of teleprompters is becoming an issue. If it is starting to become an issue why on earth would they think that Jumbo Prompter is the answer? Where is our Daniel Hannan? Just in case you missed it, here is the video of Daniel Hannan Member of the European Parliament, calling out British Prime Minister Gordon Brown for his wasteful spending and deception of the British people. After watching this stirring video, I have but one question for my fellow conservatives on this side of the pond. Where is our Daniel Hannan? I think back to Governor Bobby Jindal’s rebuttal to Obama’s address to Congress and I cannot help but wonder where we would be today if he dropped the silly sing song voice and touchy feely rhetoric and just straight up called out Obama’s Stimulus Plan for exactly what it was? A gross, reckless and irresponsible waste of tax payer’s money at a time of great economic uncertainty! Perhaps if Jindal had taken this approach we would not be considering giving the Turbo Tax challenged tax cheat Tim Geitner unprecedented powers to regulate companies! If there is an American Daniel Hannan out there, please step up to the plate now, we need you man!